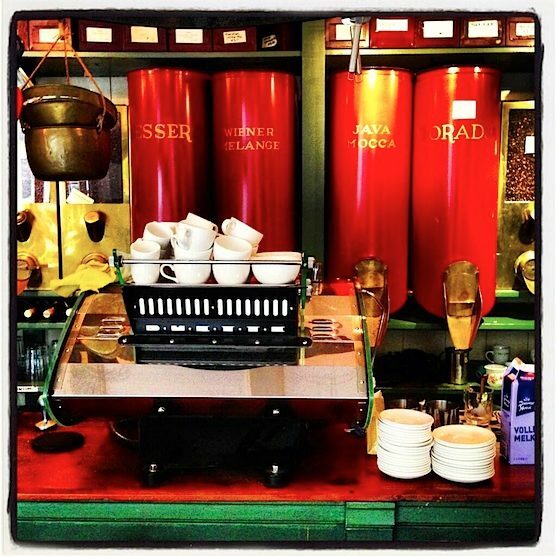 Hofje van Wijs – The Best Coffee Bar in the Red Light District! What makes this place extra special is that this use to be the home of the Godfather of Amsterdam’s Red Light District. His name was Simon Frederik Adriaanse (1927-1996), a.k.a. “Frits van de Wereld”. Frits van de Wereld (translated: Frits of the World) operated here between 1956 and 1984. He owned a bar, brothels, an illegal gambling house and the place what is now Hofje van Wijs. He was responsible for most of the drug deals that were organized back then. Firstly hashish, later heroin. In the 70’s, Frits was connected to Ling Kioe K., the biggest heroin dealer in the world. The kingpin, Frits van de Wereld, died in 1996 of an asthma attack. 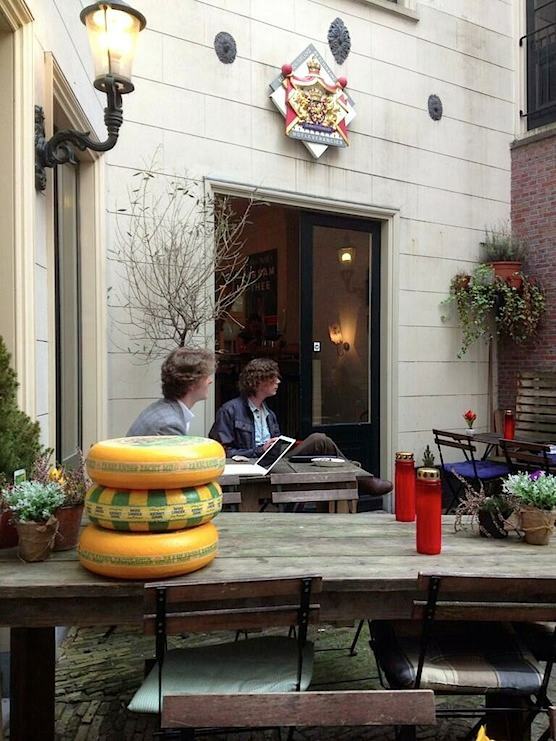 Although Hofje van Wijs is now a coffee bar and restaurant, the interior still has that great old school look. And most likely, some things inside use to be owned by Frits van de Wereld – like the fire place. Also, Hofje van Wijs has a great terrace! It’s very cozy and the perfect place to avoid the buzz of Amsterdam’s Red Light District. 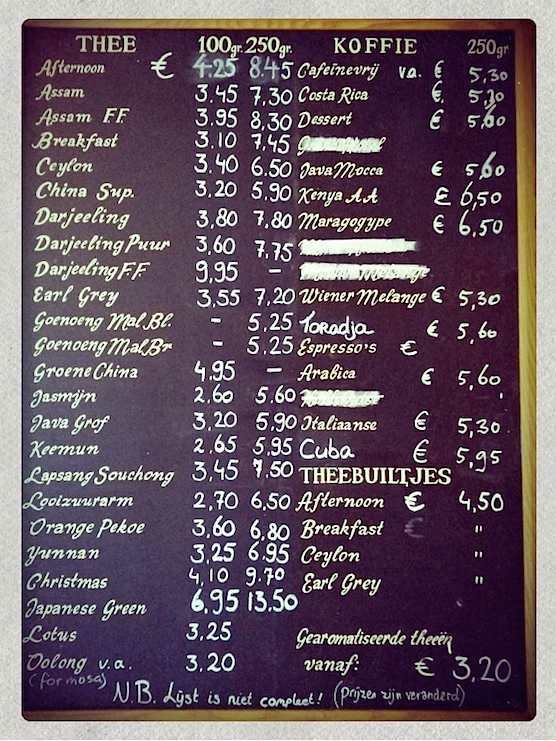 Hofje van Wijs definitely understands that people would like their coffee (and tea) before buying it. The whole place is surrounded with different kind of coffee beans and teas. 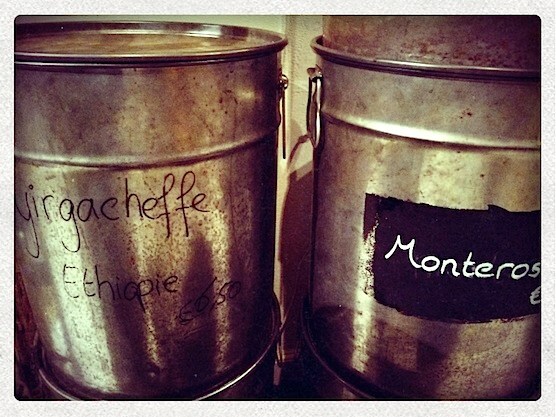 In jars, obviously…It’s great that you can see, smell and taste all the coffees and teas. This make is lots easier, choosing the right coffee or tea. 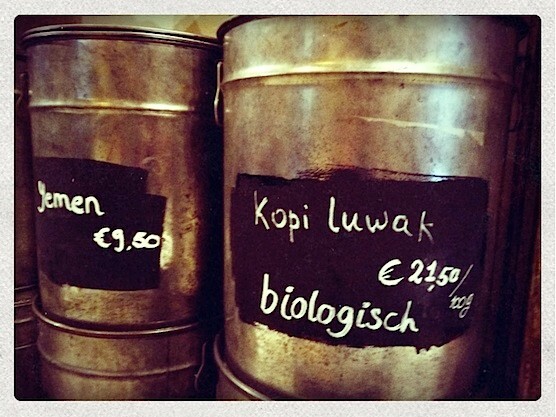 Kopi Luwak – one of world’s most expensive coffee. Hofje van Wijs only serves its own brand. They select and import their coffee beans and teas themselves. This way, they can ensure their high quality products. 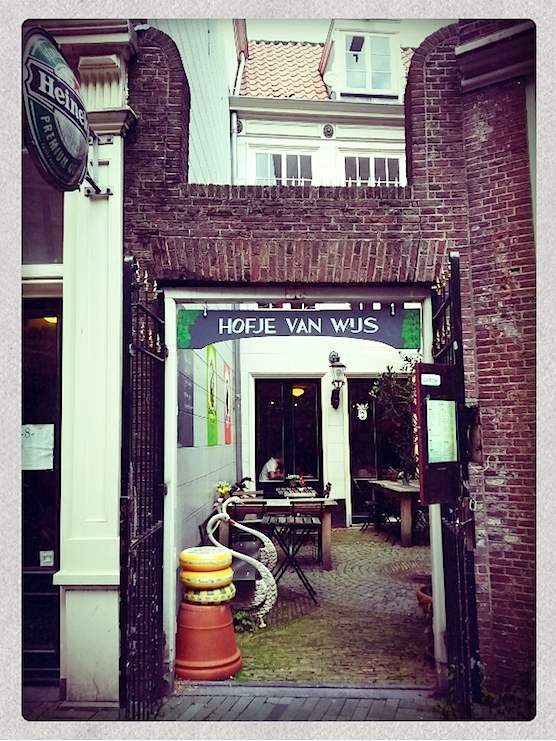 For those who are only familiar with Starbucks, Dunkin Donuts or Coffee Company, please do visit Hofje van Wijs. You’ll be amazed by the lovely flavors they have. And drinking the best coffee in the world, in a place what use to the home of a notorious gangster, is pretty awesome! But what you’re really here for are the yummy cakes. Kopi Luwak is one of the most expensive coffees in the world. The high price is not caused by the coffee beans themselves, but by special way of production. Kopi is the Indonesian word for “coffee” and Luwak is the local name for a civet cat. This cat eats raw red coffee berries. Its dejecta is being used during the coffee production.You can buy this coffee in Hofje van Wijs. Per cup or per 100 grams. It’s 21,50 Euro ($28) per 100 grams. The coffee from Yigacheffe is world renowned and acclaimed for its perfumed aromas and sweetness, which you won’t find anywhere else in the world. It has a overwhelming explosion of fruit and flowers at the first contact with the mouth. Delicious light tones of lime and sweet peach combined with exquisite Jasmine flowers aromas. Velvety acidity and a mild chocolate flavor in the body. 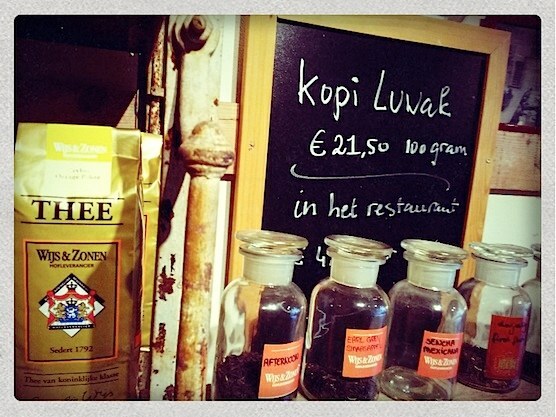 Not only does Hofje van Wijs has the best coffee beans and teas, its also offers a great view. If you would sit anywhere close to the entrance, you have a nice view on the Sea Dike. You could also sit in the back. More peacefully, it offers a stunning view on the canal of the Geldersekade. Also, the service is great! The personnel is quick, helpful and friendly. Don’t know what coffee or tea you’d like to have? Just ask one of the employees, they can inform you perfectly. Although the names on the menu above might suggest it’s about marihuana. 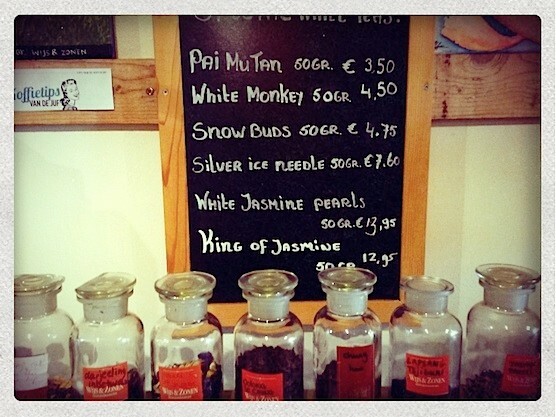 This is actually a some of the teas that Hofje van Wijs offers. Weed is the only thing that you can’t get here. They do serve food, beers, wines and soft drinks though. 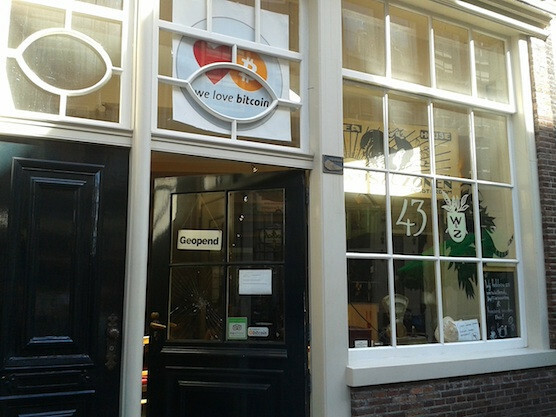 Hofje van Wijs does not only accept cash and cards, but they also accept Bitcoins! How cool is that? Spending your Bitcoins in Amsterdam’s Red Light District! How to get to Hofje van Wijs in Amsterdam? Walk: If you have Central Station behind you, walk towards the church on your left. 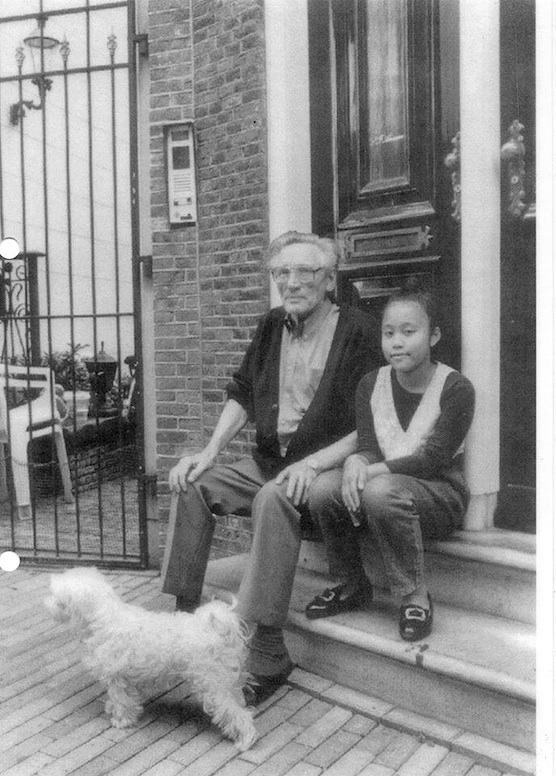 Enter the Zeedijk street, within 1 minute you’ll find Hofje van Wijs on your left. Metro: Take any metro that ends at Central Station and follow the directions above. 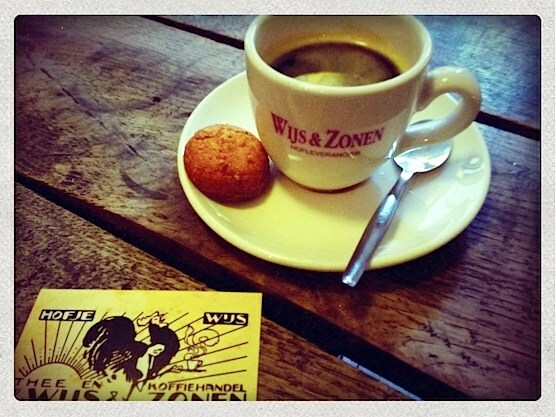 Without a doubt Hofje van Wijs is the best coffee bar in the Red Light District and perhaps even in Amsterdam. Make sure you don’t miss this place during your visit! Next to Hofje van Wijs you’ll find Mary go Wild – a new venue that offers lots of cool electronic dance products; books, vinyl, clothing and whatnot.